Violence has always been associated with football since the origination of the game and its ancestors, dating back to 225 BC. Essentially pitched battles between the youth of rival villages and towns, (most often played on Shrove Tuesdays and other Holy Days) Medieval football matches involved literally hundreds of men, sometimes in excess of 1000, and were commonly used as an occasion to settle arguments, personal differences and disputes over land. Rules existed purely on a local basis. The presence of a ball, in the form of a leather-bound inflated pig’s bladder, which could be thrown or kicked, was almost incidental to this semi-lawful opportunity for settling old scores, long running feuds and violent behaviour towards the other side. Forms of football existed in other European countries too, like Germany and Italy but the roots of the modern game however, are to be found firmly in these ancient English traditions, which were often accompanied by extended bouts of drinking and quite regularly resulted in serious injuries and even death to some of the participants. The acceptance of violence in the sport was not, however, widespread and by the early 14th century there were calls for regulations to be placed into the game. These requests arose not because of the violent nature of the game at the time, but because of the fact that, on match days it was prising local citizens away from market towns, and it was therefore bad for business. By this time the game now had a bad reputation among English royalty. Not just for its extreme violence but also because of the excessive noise made by the spectators. King Edward III banned the game, not only because of its violence and noise but for military reasons too. The game had become so popular that it was distracting members of the military from undertaking their archery practice. King Henry IV and Henry VIII also passed laws against the sport, and Queen Elizabeth I even had football players jailed for up to a week. Nonetheless, laws failed to slow down the popularity of football in the country and by 1681 it received official sanction in England. However, the standard of the game had not changed. The matches were still vicious and boisterous, with players hardly ever leaving the field without being injured or in some circumstances even killed. The sizes of each team and the field in which they played on were ignored and unorganised. 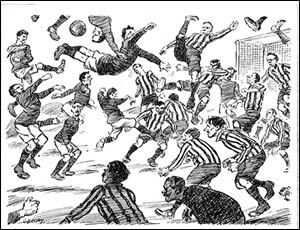 Modern forms of football emerged as the folk versions of the game were regulated and became more restrained. The much more disciplined game introduced to continental Europe in the 1900’s was this newly refined contest, imported from the sport now played by the English upper classes. Other countries all over Europe began implementing this form of the game, associated with Victorian values of fair play and re-educated enthusiasm. The transformation of the game itself from an uncontrolled battle on an imprecise field to a modern harmonised sport came largely as a result of the game moving to small arenas in built up cities. However only two periods in British history have been relatively free of football-related violence: the inter-war years and the decade following the Second World War. 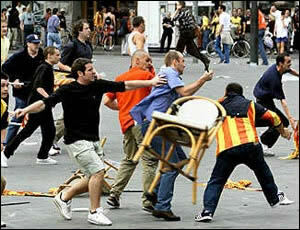 This is mainly due to a phenomenon that still exists in the game today, “Football Hooliganism”. Unlike early on in the game’s history football hooliganism does not involve violence between members of opposing teams but in actual fact violence between rival supporters.